Tomáš wished, that we will pass final receiver to his friend Stefano IZ3NVR. 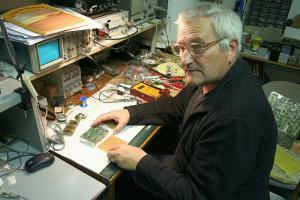 He is involved in QRSS and also wrote article about it to QST magazine. I agreed and took it as opportunity for homebrewing and explore new aspects of our hobby. We have found website of M0AYF which is full of resources of QRSS. There is also schematic of direct conversion receiver with NE602 mixer. It looked promising, but only with optional filter will be necessary. I expected worse selectivity and low immunity of used NE612 mixer. Those parameters were confirmed later during built. There is also description of thermostat module, which is known from microwave OCXO constructions. I kept decision of use oven to final tests. During first test was clear, that Tomáš bought very frequency stable crystals and there is no need place oven on crystal. So, there a lot of free space in case, which was reserved for oven’s electronics.. Unfortunately, I have not much possibilities for mechanical work, so I used case of input converter from old Hungarian TV set. 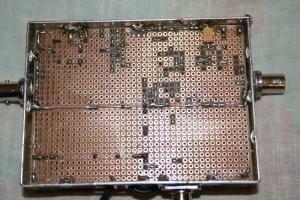 Most components are SMD for minimal and clear layout of construction. I removed original PCB from case, IEC connector and on its place soldered antenna BNC connector. I had drilled next two holes for BNC connectors for counter and audio output. Then placed universal PCB and soldered copper stripes for ground network. I followed schematic diagram and soldered all components to PCB which took me approximately 4 hours and then I performed first test without filter module. Plugged headphones to output and turned receiver on. Immediately was heard in headphones Chinese folklore music in rhythm – ťong ťang ťung ťong.. :)) Signal of AM stations came from 31M broadcast band, which was wide open that night. I read about same issue which also author struggled. 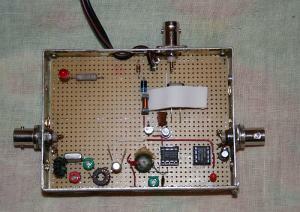 Reason was low immunity of NE612 mixer and author made simple filter and post amplifier with 2N2222 transistor. 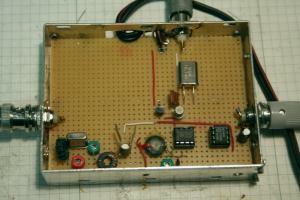 Followed his steps and put to the case filter with post amplifier as well. Next day was everything done. I tuned XF with red capacitor trimmer and I could reject AM station to minimum, almost unhearable. 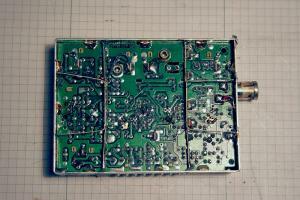 With green variable condenser in filter I set up XF up on upon audio beat of heard QRSS signals. They were nicely clean and without any noise. Those are advantage of direct conversion receivers. Next advantage is that one local oscillator is enough. Local oscillator with crystal was very stable. 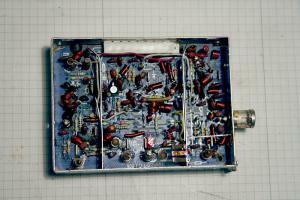 I made only one change against M0AYF design and replaced l 4uH choke serial with XTAL to 82pF condenser. 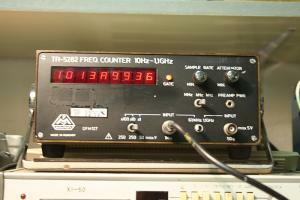 Crystal started oscillated on 10.138994 MHz frequency with long term stability +/- 3Hz. Once I connected jack to the soundcard, ARGO software started plot a lot signals from many QRSS beacons. 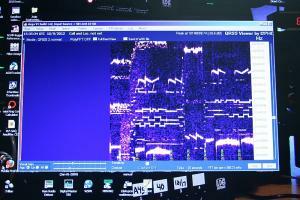 Later, during testing we decoded those stations on our screen: G0PKT, G0MBA, LA5VNA, IK6FXR, PA3BHT, IQ2DP, SA6BBS, PA9HR, G1IVG, SM0JYT and G4JQT. A lot of joy from successful work. Finally, I added choke and protection diode into supply path, tantal condenser which blocks operation amplifier and LED to indicate power state. On the top Tomáš designed label and I inserted rubber legs on bottom side. We hope Stefano will have same joy when turned it on as we had. Submitted by Des (not verified) on Fri, 2016-02-26 13:00. 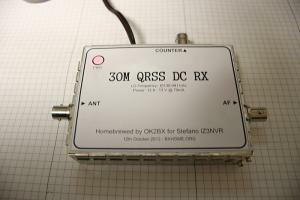 I just read about your construction project (the QRSS receiver) and was pleased to see it worked for you. I understand this was some time ago and my response is a little late but I just wanted to say "hello" and congratulations on your success.